BADAWAHS (GOBLINS) OF LAHORE – WHAT EXACTLY WERE THESE FORCES? WHAT EXACTLY WERE THESE FORCES? The word ‘Badawah’ occurs in the vocabulary of Lahore. From where the concept came, one does not know! But those were termed as small statured people who had horrible twisted faces and could silently jump long distances. They could mean harm to you or they could be innocent bystanders. We do not believe in anything that is not scientific in approach, but the term is in habitual use of Lahore, even ugly children on birth were termed with this term. I have seen the term applied to members of family I well know. In ‘Maaseray-Alamgeeri’ for the year 1674, it is officially recorded that a basket fell down in a well in the havelli of Muhammed Shafi, Mir Suman of Prince Muhammed Sultan. Two men went down into the well to recover it and both died in the process. The third went down and started shouting for help. He was brought up unconscious and on recovery, told the tale of being accosted by a black goblin, hell bent upon killing him, for interfering in his safe space. That is on official record. My grandfather used to recount such tales to my father, who told me the same. That on his way back from work, my grandfather used to feel the presence of someone walking with him. Jumping ahead of him and then making unnecessary noises. Now my grandfather was no child to tell tales from imagination. He was a perfectly rational man. So what were these Badawahs, if they ever existed? No one really knows. Suffice that they were felt and considered in the way of life in Lahore. Some research may bring out the truth of such forces. But one may never know! My visit to Heidelberg castle made me familiar with the Goblins of the Fort of Heidelberg, and how they used to drink the Royal wine and pester the women. Now Germany is a perfectly rational society, with scientific minds, and yet the legend of the goblins exist there as well as elsewhere. So much so that every year they make and sell thousands of hand made goblin dolls to visitors and I hang one in my car from decades. 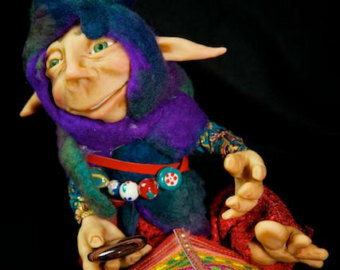 This goblin amuses me and I am not frightened of it. In fact I love it.